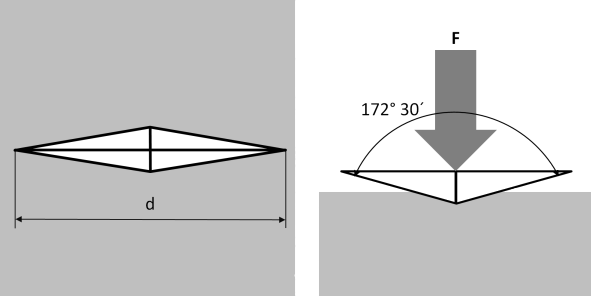 A diamond indenter, in the form of a rhombic-based pyramid with angles between opposite edges faces respectively equal to 172.5° and 130° at the vertex, is forced into the surface of a test piece followed by measurement of the long diagonal, d, of the indentation remaining in the surface after removal of the test force. This method, developed by Knoop, Emerson and Peters, was presented for the first time ever in 1939. Application primarily in micro hardness tests.